The Great Dane breed has been in existence for thousands of years. Evidence of Danes have been found in excavations of Assyrian, Roman, and Greek civilizations. The breed we recognize today has been attributed to the careful breeding work of Germany and England. Great Danes were originally bred as hunters, guard dogs, and war dogs. They were referred to by many different countries in as “boarhounds” due to their very effective use in hunting wild boar in the forests of Europe. The name of these noble dogs has changed many times over the years. The most common name that comes up is “Deutsche Dogge” or “English Dogge” depending on where you were. 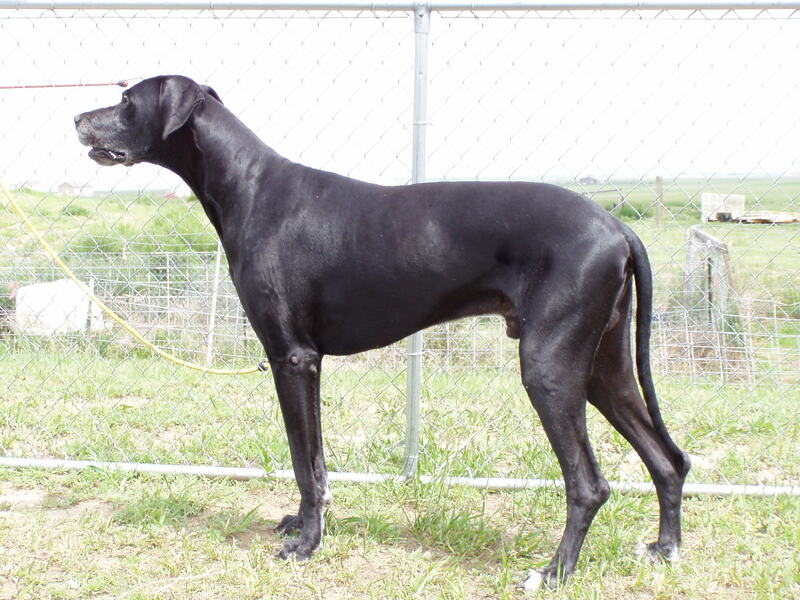 The name “Great Dane” is believed to have come from a French Naturalist by the name of Buffon. He referred to the breed as “Grande Danois” or big Dane, and for some reason this name stuck. Credit to the quality and purity of the breed can be given to the Germans as they adopted this breed in the 17th century and chose it as the National dog of the fatherland. They set a very high standard and strove to breed a dog that was large and strong, and yet retained evidence of grace, beauty, and elegance. They became the choice dogs of German royalty. During the great wars, there were two predominant breeders that survived and kept the standard of the breed going. The kennel at Ouborough owned by J.V. Rank, and the one at Send owned by Gordon Stewart has had a significant influence on the breed today. Great Dane owners today can enjoy the wonderful temperament, impressive beauty, and unrivaled loyalty of their dogs thanks to the efforts and dedication of those who saw in these magnificent animals these qualities that were worth preserving and refining. We reccomend that you go to AKC.org for the most current breed standards and colors.